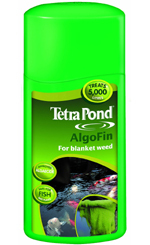 HSE approved algaecide for blanketweed. Approved by the Health & Safety Executive (HSE 7695) - independentently proven to suppress blanketweed. Directly suppresses blanketweed and other filamentous algae. Can be used in combination with TetraPond PhosphateMinus. 1000 ml (treats 20,000 L / 4,400 gallons).